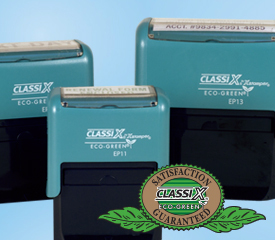 Customizable self-inking stamps are convenient for all your office and persoanl uses. Stamps come inked for up to initial 5,000 - 7,000 impressions and are re-inkable. Ergonomic handle is designed for durability and comfort Stamp material is laser engraved to provide a perfect impression every time. Available in red, black, blue, green or purple ink. Use ClassiX refill ink. Recommended Uses: Bank Endorsement, or Message Stamping. Recommended Uses: Small return address, or small message stamping. Recommended Uses: Return Address, or Phrase Message Stamping. Recommended Uses: Endorsement, Return Address or Message Stamping. Recommended Uses: Inspection, Engineering or Notary Stamping. Recommended Uses: Notary, Engineering or Logo Stamping. 10-Yr Dater - Recommended Uses: Message Date Stamping. 4-Yr Dater Recommended Uses: Date/Message stamping.